After the culture assessment has been completed, companies can access their data through our online Platform. The Platform presents 500+ data points via more than 16 report views including a comparison of the 20 dimensions, highest and lowest scoring questions, cultural positives and barriers, company priorities, data hotspots (pockets of risk and excellence), internal comparisons and benchmarking against industry sector. All views can be filtered by your specific demographics (e.g. country, role, site, department). Our online platform was developed by a team of highly experienced software developers and big data specialists in collaboration with selected members of the expert panel. We are continuously enhancing it in line with client feedback and industry needs. Examples of Platform report views are shown below. Total score and grade, 4 Category scores and 20 Dimension scores. 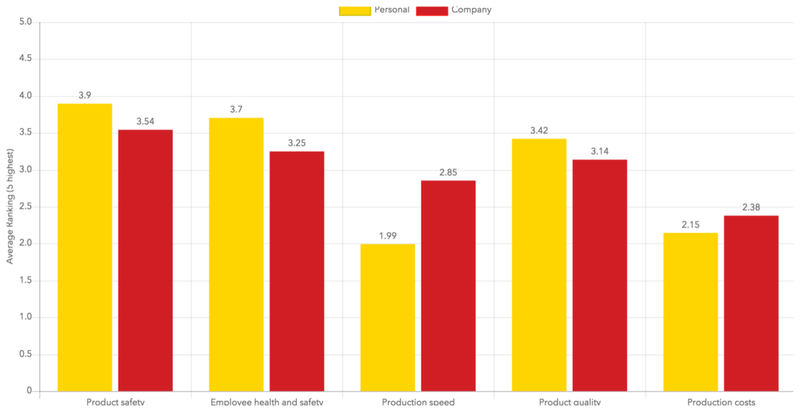 Company, industry and specific product category benchmarking. Employee priorities versus perceived company priorities. Demographic comparisons and ranking (e.g. role / site). Highest and lowest scoring Elements (which link to questions).